During World War One, shell shock eventually came to mean whatever the person using the term wanted it to mean, covering anything from malingering―faking―to hysteria, to a condition called neurasthenia, to a political statement against an unjust war. When the term ‘shell shock’ got politicized and popularized, the military banned it even before the end of World War One and psychiatrists had to stop using it, substituting instead the conditions of ‘neurasthenia’ and ‘hysteria.’ Psychiatrists at that time thought soldiers had hysteria if they were low ranking foot soldiers and neurasthenia if they were higher ranking officers, yet both of these conditions were considered to be different forms of shell shock that occurred in different forms because these men came from separate social classes. At the time of World War One, psychiatrists thought that the noise and vibrations of shells in the air literally shook the brain and shocked it. Thus, ‘shell shock.’ In reality, the psychological reactions at the time were not likely due to direct effects of shellfire on the brain, although in retrospect many World War One soldiers may have been experiencing mild Traumatic Brain Injury (mild TBI) just like soldiers with PTSD do today. In fact, mild TBI is very hard to distinguish from PTSD (post-traumatic stress disorder), and shell shock during the World War One era was likely very difficult to distinguish from mild concussions at that time as well. Soldiers with shell shock were not felt to have a legitimate war wound by either the British or the Germans on different sides of the same war, but with similar conceptualizations of psychological war wounds. 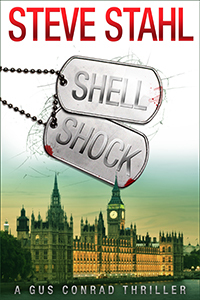 My novel Shell Shock, traces the stories of both an enlisted soldier (called ‘other ranks’) and an officer from the British infantry during World War One and tells how both men had shell shock (the lower rank soldier, hysteria and the officer, neurasthenia), but they received very different treatments based on their social class and military rank. My discussion of their treatments is based upon the historical record and actual medical accounts of how such patients were really managed by psychiatrists in Britain during World War One. It reveals how wrong the conception of psychological war wounds was at that time, confusing lower education and social status with weakness and a tendency to break down under stress and higher education and social class with nervous exhaustion that would improve with rest. Comparing what happened to these two men from World War One with the story of a modern soldier with PTSD, the narrative in my novel Shell Shock also shows how little progress we seem to have made in our understanding of psychological war wounds of combat soldiers in the past hundred years.